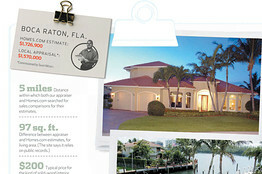 SmartMoney Magazine: The calculations behind online estimates is adding confusion to an already tricky housing market. Jason Gonsalves worked hard to turn his 6,500-square-foot stucco-and-stone home in the suburbs of Sacramento into the ultimate grown-up party pad. Inside are the game room, home theater and custom wine cellar. Outside, there's the recently added piece de resistance -- a wood-burning pizza oven, kegerator and searing station, all flanking an infinity-edge pool that overlooks the lapping waters of Folsom Lake. A spread like that doesn't come cheap, of course, so when interest rates fell recently, Gonsalves, who runs a lobbying firm, looked into refinancing his $750,000 mortgage. That's when he got some startling news -- even as he was putting the finishing touches on his home, it had dropped more than $200,000 in value over a seven-month stretch. New Housing Data: Are Sellers Caving Too Early? Or at least, that's what one popular real estate website told him. Another valued Gonsalves's pad at a jaw-droppingly low $640,500. And these online estimates left him all the more confused when a real-life appraiser, assessing the house for the refi loan, pinned its value at $1.5 million. "I have no idea how those numbers could be so different," Gonsalves says. Right or wrong, they're the numbers millions of consumers are clamoring for. In a housing market that's been mostly a cause for gloom, so-called home-valuation technology has become one of the few sources of excitement. After years of real estate pros holding all the informational cards in the home-sale game, Web-driven companies like Zillow, Homes.com and Realtor.com are offering to reshuffle the deck. They've rolled out at-your-fingertips technology via laptop and smartphone to give shoppers and owners an estimate of what almost any home is worth. And people have flocked to the data in startling numbers: Together, four of the biggest websites that offer home-value estimates get 100 million visits a month, and one, Homes.com, saw traffic jump 25 percent in the three months after it launched a value estimator in May. "Consumers used to use us for home buying and move on," says Jason Doyle, vice president of Homes.com. "Now we can stay engaged with them." A close look at online appraisals compared with local appraisals in Lake Bluff, Ill., Atlanta, and Boca Raton. Real estate voyeurism aside, the stakes are high for many of the sites' visitors. Homebuyers use the estimates to get a feel for what's on the market and, later on, to figure out whether their bid will entice a seller to play ball. Vigilant homeowners like Gonsalves check their values to help decide whether it's worth the hassle of refinancing, while others who are ready to sell use them to gauge if they're priced right for the market. Real estate agents, meanwhile, say they're increasingly resigned to spending more time answering questions -- or arguing -- about the estimates. "It's an evolution for consumers," says Gary Painter, director of research at the Lusk Center for Real Estate at the University of Southern California. Banks and other lenders are piggybacking on the trend as well, with some even showcasing the upstarts' estimates on their own websites. While lenders say they don't use the estimates to make final decisions about loans, they say Zillow in particular has become a go-to tool for their preliminary research on homes. "I use it every day," says Zach Rohelier, a mortgage banker at LendingTree. But for figures that carry such weight, critics say, the estimates can be far rougher than most consumers realize. Indeed, if the websites were dart throwers, they'd seldom hit the bull's-eye, and they'd sometimes miss the board entirely: Valuations that are 20, 30 or even 50 percent higher or lower than a property's eventual sale price are not uncommon. The estimates frequently change, too, for reasons that aren't always easy for homeowners to discern. According to the companies themselves, some quotes have swung by hundreds of thousands of dollars in as little as a month as new data gets plugged into the algorithms the sites rely on. (Those algorithms also change, as happened this summer when Zillow made adjustments that affected all of the 100 million homes in its database.) And while the sites say it's probably rare that individual homeowners (or real estate agents, for that matter) game the system, they do acknowledge that people can enter information that might push estimates higher. Put it all together, say pros, and you've got numbers that have become head-scratching legends in one community after another: a Hollywood Hills aerie losing 47 percent of its value in one month (with no earthquakes or mud slides to explain the drop); a century-old home in Louisville, Ky., that, according to local lore, served as the inspiration for Daisy's home in The Great Gatsby, quadrupling in value over 30 days; and one townhouse in Brooklyn, N.Y., listed now for $5 million, valued at a whopping $31 million in the midst of the real estate crash -- at least according to Zillow. Zillow says the Brooklyn valuation was an error that it subsequently corrected. And make no mistake, all of the competitors go out of their way to make it clear their numbers are guesstimates, not gospel. "A Trulia estimate is just that -- an estimate," says a disclaimer on that site's new home-value tool. Zillow deploys similar language and goes a step further, publishing precise numbers about how imprecise its estimates can be. And every major site urges home-price hunters to "always consult with a real estate agent or house appraisal specialist," in the words of Homes.com. Indeed, these sites say they have strong relationships with the real estate business in general; they get a significant share of their revenue from the industry, in the form of advertising and subscriptions. But when the real estate version of Pandora's box is opened, homeowners don't necessarily pay attention to disclaimers. Consumers and pros alike say many Web surfers put enough faith in the estimates to sway the way they shop and sell. "I'm constantly explaining to clients that those numbers don't come from a person," says Mindy Chanaud, a real estate agent in Greenwich, Conn., who launched into what she calls her Zillow spiel when shown a Zestimate of one of her listings. Frank and Sue Parks, former owners of the Gatsby house in Louisville, watched as the site put a $331,000 value on the dwelling in May; by July it had climbed to $1.5 million. (Zillow says the lower estimate reflected errors in its statistical model.) The couple got some potential buyer referrals from the site, but they had to fend off a stream of lowball offers before they sold their place this fall. They're convinced that the estimate roller coaster accounted for some of that. Says Sue, "It really affected our ability to move the place." For most of real estate history, of course, determining a home's value has been an appraiser's job. Appraisal involves gathering data on recently sold homes in the area and comparing them with the "subject property" on matters like size, condition and characteristics, before coming up with an estimate of the home's worth. If the property has, say, a swimming pool, but most recently sold homes don't, the appraiser might add a premium to the sale value. Still, the exercise involves as much art as science, as appraisers acknowledge. The more unique or luxurious a property, the harder it is to accurately value. "Imported marble and a view of the ocean are going to be more or less valuable depending on market conditions," says Susan Allen, a vice president at CoreLogic, a data and analysis provider in California. And critics have accused a few appraisers of inflating the value of properties or rubber-stamping other people's estimates to ensure that deals went through. The response, beginning in the late 1980s, was the rise of the machines. Economists started developing automated valuation models, or AVMs; instead of having a person visit the property and crunch calculations, these computer models sync the math with data about comparable sales, square footage, number of bedrooms and the like, all in a matter of seconds. Rob Walker, a managing director at AVM purveyor Lender Processing Services, says the models sped up the approval process for second mortgages and home-equity loans; indeed, for years, the tools were mostly reserved for in-house nerds at lending banks. It wasn't until 2006 that Zillow took them to the masses, with its Zestimate. The company runs data on more than 100 million homes through its own algorithms that recognize relationships between property characteristics, tax assessments and recent transactions. "Humans don't make these decisions," says Stan Humphries, chief economist at Zillow. Scores like these have helped build successful business models for some companies -- Seattle-based Zillow, for one, just raised $69 million in an initial public offering. And they've become weapons in the arsenal of consumers like Terence Avella, an attorney in Eastchester, N.Y. After he and his wife became enamored of a four-bedroom Victorian with an asking price of $650,000, Avella consulted Zillow, finding a much lower valuation: $510,000. He says the Zestimate reinforced his belief that the house would need extensive renovations -- and he put up a lowball bid. By the time the process was over, Avella had settled on an offer of just $580,000 (though the negotiations later fell through). Indeed, in a market where listing prices often reflect hope more than reality, some agents and consumers say that online tools are a useful reality check. 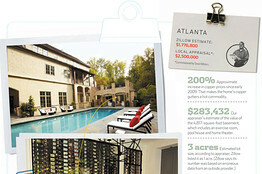 Simms Jenkins, an Atlanta marketing executive, says he's recently relied on sites like these to both buy and sell homes. "I can't imagine 25 years ago, when people would just go out and spend their entire Saturday looking at homes," Jenkins says. "You don't have to do that now." But what's a godsend to Jenkins is an ongoing mystery to Mike Battaglia. Battaglia lives in a Frank Lloyd Wright inspired mansion in Louisville, on a historic street, across from a lush park. But his neighborhood is decidedly eclectic -- homes like his sit near much smaller starter homes -- making it a challenge, local appraisers and agents say, to figure out how much each home is worth. Among the online estimates, that difficulty plays out in real time. Homes.com valued the manor at $761,700, but that figure dropped $85,000 in a month. Zillow pinned its worth at $1.1 million in December 2010, then posted no Zestimates at all for several months -- only to peg its value at $327,000 in May, a 70 percent haircut. By fall, it was back up to $1 million. Battaglia, a business consultant, says he knows the numbers are only estimates, but he still thinks that notion doesn't register with people: "It's the perception of value that affects people's psychology." Zillow says its wide range of estimates was a result of volatility in the local market. Homes.com's Doyle declined to comment specifically on Battaglia's house, but says that a home in a neighborhood like his could definitely be vulnerable to inaccuracies. "If there's a transaction next door and someone just gave away a house, it will throw off the model," Doyle says. Indeed, appraisers and real estate consultants say that those models veer off target with alarming frequency. Typically, data for valuation models come from two sources: records from tax assessors and listing data for recent sales. Middleman companies -- the dominant ones are CoreLogic and Lender Processing Services -- gather this data from more than 3,000 U.S. counties and license them out to the Web sites and other model-builders. Collection is itself a challenge, because not every county tracks properties the same way. In North Carolina's high-tech Research Triangle, anyone can get data directly from the Wake County website, while in rural Wright County, Mo., tax rolls are available only on paper. The size of a home could be reported by square footage or by the size of each bedroom and bathroom, so data companies must "scrub" the data to make it uniform. Even then, the data isn't always useful in the field, say real estate pros. County assessors often use AVMs in newer subdivisions where floor plans don't vary much. But with custom homes or neighborhoods going through gentrification, the models can go haywire. "You cannot use a computer model in certain areas and expect the value to come out right," says John May, the former assessor of Jefferson County, Ky. Some properties' data can be too tough a nut for any computer model to crack. On a quiet street in one of Brooklyn's grander old neighborhoods stands the brownstone that, according to Zillow, was worth $31 million in 2007. "I don't even know if there's ever been a home in Brooklyn worth that much," says a spokeswoman for The Corcoran Group, the agency that now lists the property on the market, for $5 million. Zillow declined to discuss why its earlier estimate was so high, but a look at the house's records suggests one potential reason for the enormous spread: Although the address is a two-family townhouse, the current owners use the entire house, giving them square footage that's off-the-charts big by New York City standards. Public records are hardly the only problem. Automated models aren't designed to account for the unique details that often make or break a deal -- something their designers readily acknowledge. AVMs usually can't capture data that determines the condition of a property, such as whether there's been a ton of wear and tear. Is a home right next to the railroad tracks or a golf course or a landfill? AVMs can't always answer those questions, say industry pros, though GPS technology is improving things on that score. Models also can't decipher the motivations of a buyer or seller, says Leslie Sellers, a past president of The Appraisal Institute. A couple who's going through a nasty divorce, for example, may have taken the first offer that came along just to unload the property. For all these reasons, says Lee Kennedy, managing director of AVMetrics, a firm that audits and tests industrial-grade AVMs, the models that banks use often add a "confidence score" to their value estimates, with a low score signaling that it's best to send in a human appraiser. Consumers, however, don't get to see a confidence score; instead, they get disclaimers, some of which are eye-opening. Zillow surfers who read the "About Zestimates" page find out that the site's overall median error rate -- the amount the estimates vary from the actual fair value -- is 8.5 percent, and that about one-fourth of the estimates wind up being at least 20 percent off the properties' eventual sale price. In some places, the numbers are far more dramatic: Gibson County, home of the West Tennessee Strawberry Festival, has a 57 percent error rate; in Hamilton County, Ohio, where the Cincinnati Bengals play, it's 82 percent. Site users are always one click away from this data, but agents say few homebuyers read it (on Zillow's homepage, the font for the "About Zestimates" link is slightly smaller than the main home-data type -- and quite a bit fainter). The sites argue that, over time, edits and corrections will help them perfect their numbers -- and many of the corrections will come from their customers. On Homes.com, for example, anyone who knows certain specifics, like a homeowner's surname and the year the home was last purchased, can edit the details to reflect, say, a sprawling two-bedroom addition. Zillow also allows site visitors to modify its property details, and in four years, it has accepted revisions on 25 million homes -- perhaps the strongest testament to how seriously consumers take the estimates. 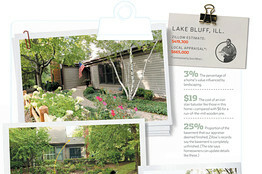 Today, Zestimates are helpful enough, says the site, to give consumers an accurate sense of any home's value. In the meantime, says Humphries, the company's economist, "We're always tweaking the algorithm or building a new one." But in the eyes of some skeptics, that tweaking only increases the potential for off-base estimates. Steve Levine, a real estate agent in Shrewsbury, Mass., says he recently changed his home description on one site, adding the fact that he has a finished basement. Over the next six months, his home rose from $516,000 to $558,000 -- a healthy 8 percent -- while a neighbor's nearly identical home sank in value. Levine says he has no way to tell how big an impact his update made, "but being able to change the facts is one more tool for manipulating the system." The sites say they believe intentionally wrong changes are rare, but acknowledge they can only go so far policing those tweaks. "It's not 100 percent bulletproof," says Homes.com's Doyle. In the future, of course, homeowners may look at today's estimates the way they look at those enormous console televisions from the 1940s -- as an awkward early phase for what became a ubiquitous, reliable technology. But in the meantime, many are content to use them, flaws and all, whether in earnest or as entertainment. In an exurb outside Phoenix, Mike Lang, a commercial-property manager, has seen his home jump almost 20 percent in value on Zillow in the past few months -- he's not sure why. Though he's not moving any time soon, he's enjoying his time at the top of the real estate heap. "I've got the most expensive house in the neighborhood," Lang says.